A Collection is a group of individual objects represented as a single unit. Java provides Collection Framework which defines several classes and interfaces to represent a group of objects as a single unit. The Collection interface (java.util.Collection) and Map interface (java.util.Map) are the two main “root” interfaces of Java collection classes. 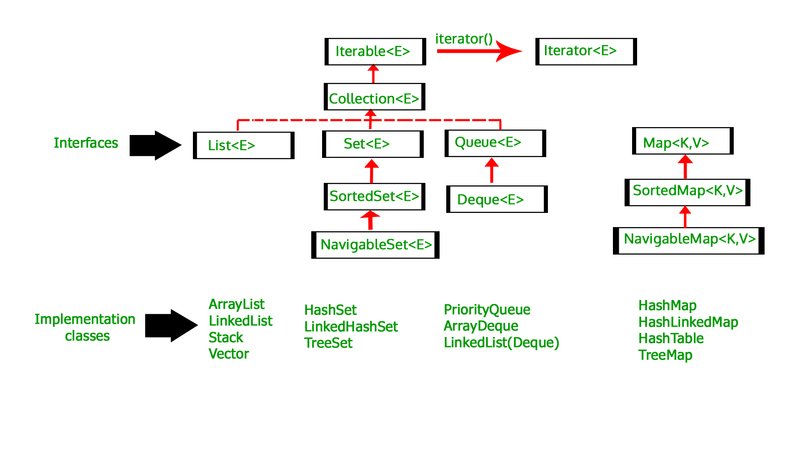 Before Collection Framework (or before JDK 1.2) was introduced, the standard methods for grouping Java objects (or collections) were Arrays or Vectors or Hashtables. All of these collections had no common interface. As we can see, none of these collections (Array, Vector or Hashtable) implement a standard member access interface. It was very difficult for programmers to write algorithms that can work for all kinds of Collections. Another drawback being that most of the ‘Vector’ methods are final, meaning we cannot extend the ’Vector’ class to implement a similar kind of Collection. Java developers decided to come up with a common interface to deal with the above mentioned problems and introduced the Collection Framework in JDK 1.2. Both legacy Vectors and Hashtables were modified to conform to the Collection Framework. Consistent API : The API has a basic set of interfaces like Collection, Set, List, or Map. All classes (ArrayList, LinkedList, Vector, etc) that implement these interfaces have some common set of methods. Reduces programming effort: A programmer doesn’t have to worry about the design of Collection, and he can focus on its best use in his program. Increases program speed and quality: Increases performance by providing high-performance implementations of useful data structures and algorithms. Note that this diagram only shows core interfaces. contains(), isEmpty(), addAll(), ... etc. BST based). Note that TreeSet implements SortedSet. implementation are HashMap and TreeMap. have only keys, whereas in Map, we have key, value pairs. We will soon be discussing examples of interface implementations. This article is contributed by Dharmesh Singh. If you like GeeksforGeeks and would like to contribute, you can also write an article and mail your article to contribute@geeksforgeeks.org. See your article appearing on the GeeksforGeeks main page and help other Geeks.